TfL gives tube workers the option to hide their identity to protect themselves against being stalked or harassed by passengers. Transport for London gives tube staff fake names to protect them from passengers who might try to stalk or harass them, it has emerged. The option of staff using badges bearing false names is available for any London Underground worker who deals with the public and feels they might be at risk. The policy has been in place for 15 years. TfL said it did not collect statistics on how many staff had opted to change their names to protect themselves nor on incidents of stalking and harassment. A spokesperson said that a reason had to be given for making such a change, for example if the employee’s real name was an uncommon one. However, one London Underground employee with a common name told the Guardian that many staff opted for the name change simply to make them feel safer at work. “Social media has definitely put us more at risk,” said the member of staff, who has a customer service role at a station. “People sometimes do try to track us down through Twitter or Facebook. Most members of the public are absolutely lovely but there are a minority who can cause problems and try to pursue a vendetta against a particular member of staff for no good reason. 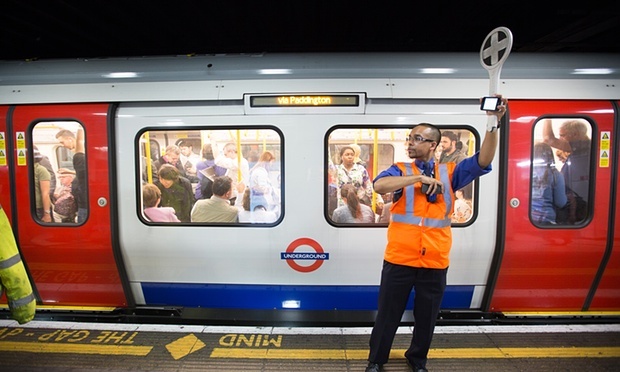 Steve Hedley, assistant general secretary of the RMT union, said there had been numerous occasions over the years when underground staff had been stalked or harassed by passengers. Violence against staff is also a problem. In 2008/9 there were 1,873 incidents of violence against London rail and underground staff and in 2013/14 it had jumped to 3,049 incidents. Despite a reduction last year, there were still 2,038 reported attacks on staff.